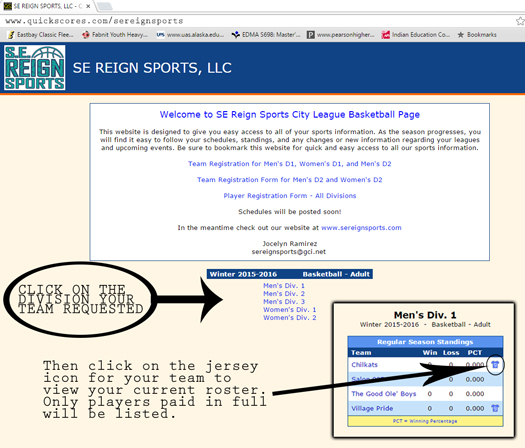 With some tedious work we are able to maintain rosters through our online registration site. Please visit http://www.quickscores.com/sereignsports to view your current roster of PAID players. If players have told you they have registered but you don’t see them listed, they most likely have registered through the quickscores player registration, but haven’t completed the payment process. Encourage these players to find the PayPal email link to complete their online payment, or have them re-register with a credit/debit card ready to pay. Follow the directions on the image below to view your rosters, updated at 9am on Wednesday 10/21/15. We will update the roster list later this afternoon before the registration deadline.